First we have a couple of late recaps! Click here for Nick Verreos. This is really cute! Check out "Project Gunnway..."
More from Uncle Nick (and Season Six) here. Here is an interesting interview with Christian Siriano. Finally, here is a TVGuide exit interview with Suede. Stay tuned BPRs, I am working on an Episode Eleven Trivia Contest with some fabulous prizes. I'll post it within the hour. I was thrilled to receive a "screener" of the first episode of season two of Tim Gunn's Guide to Style and I am happy to say that there are many improvements. The biggest change is the new co-host and fashion accomplice, Gretta Monahan. She is adorable. She has a beautiful smile and dimples and she feels like a friend. Gretta has several wardrobe changes during the first episode and she looks fabulous in every scene. Right off the bat you will notice that there is no staged "Surprise, Tim Gunn is coming to your house!" phone call. But they have kept the things that make the show unique and special. The Optitex is still helping the makeover subject to visualize her shape and how certain styles and silhouettes look on her. They are still stressing the importance of the right undergarments. Of course, my favorite part of every episode is when they visit the designer showrooms. Only Tim Gunn could provide this kind of access. In this episode, they visit Gilles Mendel and he is completely charming and very generous. The makeover subject in this episode, Meredith, is especially endearing. She is intelligent and appreciative and seems to be really paying attention to Tim and Gretta. Her transformation is remarkable. Check out these previews and tune in to Tim Gunn's Guide to Style on Thursday night! Two challenges in a row without the models, but I loved seeing the designers walk the runway! How cute was Kenley? She worked it! I also loved Leanne in that crazy hip hop outfit. Model picking drama. At this point in the season we have so many good models that it was inevitable that some great ones would go. Karalyn and Polina! Of course we saw them walking in Bryant Park for Joe, he didn't let these beautiful, talented girls go to waste! It is odd to watch the show knowing who the final three are. Don't worry, I'm not saying a thing! So, there's not much more to add about the models this time, since they didn't take the runway. I, of course, will have a lot to say next time they walk! They will be walking for their places in the finale next week.. so you KNOW they will be workin it! But, as you can see from the runway pictures, Jerell, Kenley, Korto and Leanne have the same models as who they have just chosen. It's basically up to the judges now, models! Arion is a high-school student and aspiring designer. He has remained in touch with his favorite season two designer and finally had the chance to meet her in person! "NBC Universal is pleased that the court granted our motion for a preliminary injunction against The Weinstein Company. 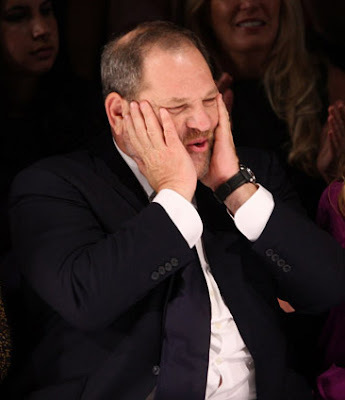 The overwhelming evidence demonstrated that The Weinstein Company violated NBC Universal's right of first refusal to future cycles of Project Runway. After hearing all of the evidence, the court issued an order prohibiting The Weinstein Company from taking the show or any spin-off to Lifetime." Perhaps the switch to Lifetime is not a "done deal" after all! Click here for Mo Ryan's take from the Chicago Tribune. Lifetime: "We are disappointed with the court's decision to grant the preliminary injunction against the Weinstein Company.," Lifetime said in response to the ruling. "It's unfortunate that the people hurt most by this ongoing dispute are the loyal fans of Project Runway. In the meantime, Lifetime will pursue all measures to uphold its valid and binding agreement reached with the Weinstein Company for Season 6 of Project Runway." "We are glad that the court held that NBC Universal cannot exhibit the program on Bravo and that court required NBC Universal to post a minimum $20 million bond. Obviously we will be appealing and remain committed to our partners," the Weinstein Co. said. 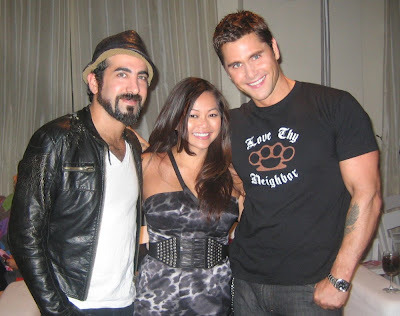 Kevin Christiana, Chloe Dao and Jack Mackenroth at the "Pose For a Cure Event." Click here for more from Jack about "Living Positive By Design." Click here for Nick Verreos's Red Carpet Recap from the Emmys. Entertainment Weekly has posted an exit interview with Suede. Attention Boca Raton, Florida: Christian Siriano will be appearing at the Town Center Mall on November 15th. Click here for details. 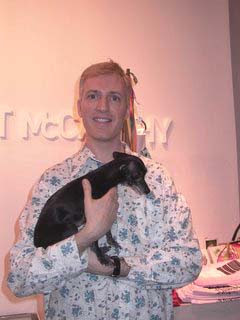 The Minx takes a look at Emmett McCarthy's QVC line. More here. Best Week Ever features Leanne's rap! Click here for Jack Mackenroth's UsMagazine.com recap of last night's episode. Click here for the MTV recap. BPR friend Dan Renzi has posted a new interview with Jack Mackenroth. Finally, click here for the Entertainment Weekly recap. You won before with the 'Rings of Glory' challenge and this week you once again demonstrated your creativity and your craftsmanship. Your metallic, distressed and bleached denim treatment was termed energetic and "right on the money" and "felt authentic" to LL Cool J. 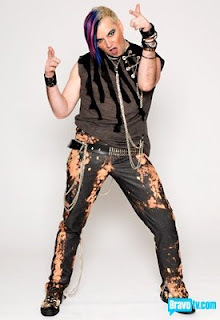 The pants looked expensive and not only fit Suede well but suited his punk persona. The top was complicated with a built-in chain detail and you cleverly added fabric insets as a nod to his pseudonym. This was your first menswear design and you took it all the way to victory. Kudos to Korto. This post is only for positive words for Korto Momolu or her garment. If you have anything else to say about another designer or the challenge, please click here. It was music night on Project Runway and there was plenty of drama as the fight for Bryant Park continued. Post your reactions to Episode 11 here. 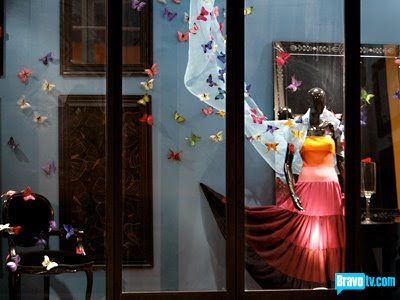 With only five designers left and three spots to fill for the finale, the tension mounts tonight on Project Runway! The BPR party room will be smokin' as welcome in Episode 11, Rock 'N Runway. All are welcome to join fans from across the land to share your wit and wisdom as we watch along together. Come on in, the party room is open! BPR regular Tropical Chrome takes to the play-by-play booth again this week for live coverage of Epiosde 11: Rock 'N Runway. TC will bring you all of the drama, the ins and the aufs as they happen. If you find yourself without Bravo access this evening, this is the place to be! Comments under this thread are for you to read and TC to post. If you have something to say, come join us in the party room above! The BPR party room opens at 8:00 p.m. for all of you animals out there who can't keep quiet. The joint will be hoppin' and if you haven't been there before, no better time to start! BPR legend Tropical Chrome is back by popular demand to handle play-by-play duties beginning at 9:00 p.m. No Bravo? No problem! TC will tell you about all the drama as it happens. After the show, tell us what you think in our weekly reactions thread. And we want to know what you really think! Around these parts, Wednesday is the best day of the week. TGIW! Bri Dellinger is a "Magical Elf." Congratulations Bri and ALL of the Elves for your Emmy nominations. I was so excited to be among the editor nominations for Project Runway this season. In preparing for the event, the main question is “what (or who) are you going to wear?” Well, I thought it was appropriate to wear the gorgeous Cord Dress Coat that Kit Pistol made for me last fall. I absolutely love this dress and just to report for the BPR fans, Kit is an amazing designer and so fun to work with. I had fallen in love with the dress from seeing her portfolio from Season 4, episode 1 so she tailored it to my specifications. All night the dress received attention from people who wanted to know who had made my dress. It stood out in that sea of Emmy gowns! I don’t have pictures on the red carpet because I was just too excited to be there to remember to take photos. One photo here really shows off the dress nicely. I’m standing with a fellow editor, Michael at our pre-party. The other picture is with Kit at our Magical Elves after-party. Although our team didn’t win the Emmy, we had a lovely evening and I certainly felt pretty in my dress. 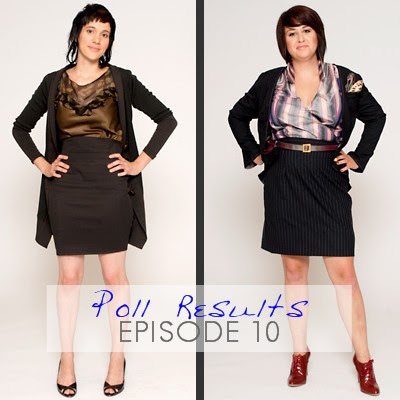 Our polls for Episode 10 are closed and once again you felt the judges got it right. You agreed with the judges and felt that Jerell Scott deserved the win. Click here to see the results. You also concurred with the judges and thought that Joe should have been the 'auf.' Click here to see the results. Heidi Klum backstage at the Emmy Awards wearing Christian Siriano from his Spring 2009 collection. Christian Siriano makes his first entrance on the Emmy Award red carpet. 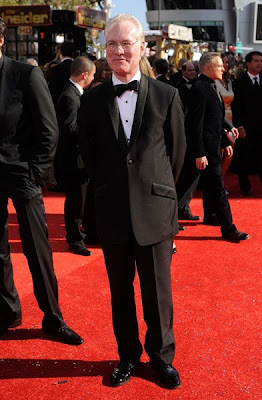 Tim Gunn, always dashing, on the red carpet at the 60th Annual Primetime Emmy Awards. And another Project Runway designer (and BPR perennial favorite) created a red carpet look for the event. Click here. Here's Heidi Klum arriving on the Red Carpet as she prepares to co-host the 60th annual Primetime Emmy Awards Ceremony in Los Angeles. 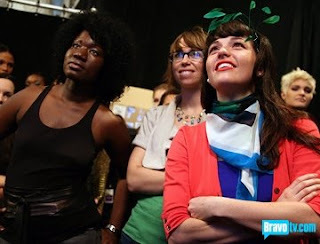 Is this the year that Project Runway finally gets by The Amazing Race for Outstanding Reality Competition Program? Sweet P and her husband Sage are collaborating on an art/fashion event called "Ghosts in the Garden." Click here for more information. Click here for Jim Cantiello's post about attending Fashion Week with Sweet P.
The Cut has posted a new interview with Project Runway Season Four finalist Jillian Lewis. Click here for an interview with Kit Pistol and Steve Rosengard. 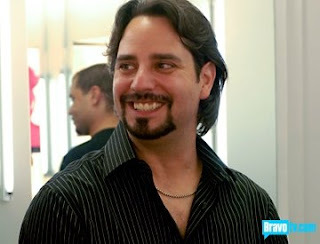 Click here for an exit interview with Joe Faris from Entertainment Weekly. This is fun! How many Project Runway designers can you spot in the 100 "most fabulous" Fashion Week looks from New York Magazine? How many Project Runway designers' looks are included in the 100 "most hideous?" Ouch! Thanks Ann. Click here for the original Access Hollywood article. Click here for Trent's Take. Sweet P's gown as featured on Top Design! First I have to admit that I am WAY behind in the mail, with over 400 unopened e-mails. If you have written and not received a response I am very sorry! I'll try to catch up over the weekend. Speaking of Sweet P - I hope everyone watched Top Design on Wednesday! 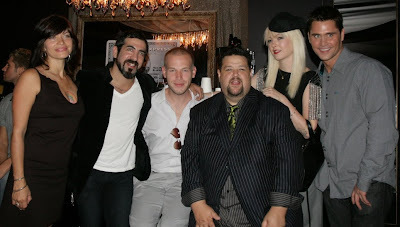 Sweet P, Daniel Franco, Andrae Gonzalo, Jeffrey Sebelia and Santino Rice all appeared in the episode. It was a great show. I love it when Reality Worlds Collide. 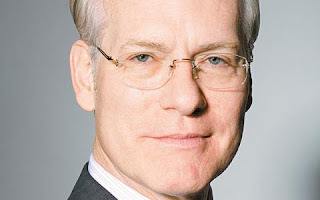 Tim Gunn and Gretta Monahan talk to TVGuide.com about what to expect on the red carpet at the Emmy Awards on Sunday. Meanwhile, Heidi Klum retains absolute composure while her four co-hosts dissolve into a "scuffle" on the Jimmy Kimmel Show. Click here to watch a clip. And what will Heidi be wearing? According to this article from The Associated Press, she may have eight changes, possibly something from a certain Project Runway designer. Jillian Lewis is designing dance costumes! Click here to see her sketches. 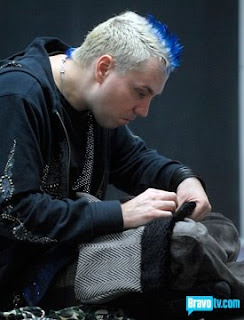 Laura K. interviews Project Runway Season 5 designer Joe Faris. Click here for his website. Click here for the podcast. Photo courtesy of Lisa Gilpin. LK: We left the AmEx SkyBox and headed downstairs to The Promenade for the show. Right away we spotted Kelli Martin and Jennifer Diederich. They were adorable. After watching them on the show and interviewing them for the podcast I felt like I already knew them and just plunged right in to a conversation. Jennifer is tall! Kelli was with a friend who sounded exactly like her. Scar: I'm always struck by how the designers look ten times better in person than they do on TV. I mean, they are attractive on the show but exhausted and attractive. When you see them in person they are better rested and not as stressed. Anyway, Kelli and Jennifer were adorable and both greeted us warmly. Tbone: I skipped that ridiculous air-kiss mob scene and made quick for my seat so I could evaluate the contents of the Bravo gift bag. What fabulous flotsam would they provide that we could give away in one of our contests, I wondered? LK: Laura Bennett was signing an autograph for a young fan. I also spotted a mom with three adorable daughters all in braces. I asked them who they were rooting for and it took them a while to answer. Finally one said Kenley and the others agreed! So cute. Scar: Blayne Walsh was who I saw next. He could easily pass for a male model. I think we suggested he try out for, 'Make me a Supermodel.' He looks very California, very surfer. Tbone: Blayne was much taller in person than I imagined him to be. He had on a very cool outfit that he designed himself. I could easily see him being successful doing menswear. LK: Blayne is certainly as tan as you would think - and has a strong jaw and a very handsome face. He was friendly and CUTE. You've seen the designs on the runway and now it's your turn to be the judges. This week you are Heidi Klum, Michael Kors, Nina Garcia and Cynthia Rowley. 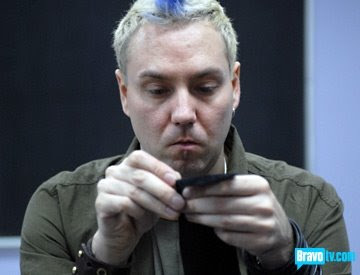 Kindly email your podcast questions for Joe to Team BPR by 10:30 Eastern. And another one bites the dust. Post your reactions to Episode 10 here. After a whirlwind trip to NYC, Tbone returns to his native habitat tonight for live play-by-play coverage of Episode 10, "Transformation". If you find yourself with out Bravo this evening, we'll bring you the ins and aufs live as they happen. Comments under this thread are for you to read and Tbone to post. Have a witty observation to share? Head to the party room above! Sure, we have a little bit of model drama this season with Runa and Shannone both dropping out, but so far, we haven't seen any model-stealing walkoffs. I am wondering how Karalyn winds up walking for Joe in the finale show. I can't believe that Leanne would willingly switch Karalyn for someone else. Also, it is kind of late in the game for Heidi to pull out the velvet bag and just arbitrarily assign new models to the designers. Since, "Models, this is also a competition for you, as well..." switching now kind of confuses the "Elle spread." If Leanne wins, will Tia get the spread? At this point in the competition, we should have a clear pairing of designers and models, meaning that the winning designer's model will get the spread. I am not posting photos on the front page to avoid spoilers, but if you want to click on the collections at the top of the page you can check them out. Also, click here for Karalyn's blog about the show. Katarina is with Korto in the finale and Nicole is with Jerell, but for the rest, it gets confusing. Tia is with Leanne, Topacio is with Kenley, I don't see any of the last six models with Suede - do you? Theories? Will Joe win the next challenge and switch Topacio for Karalyn? Will Kenley win and switch Germaine for Topacio? 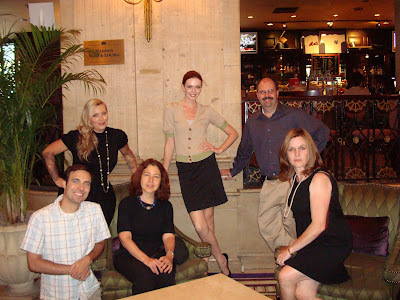 After a restless night and considerable backstage banter with Team BPR, our fearless Swami of the Runway Alan Gratz lends his loquacious logic to Episode 10 in his weekly predictions post.Go ahead and try to follow along as he works out the impending model shake-up! Not to be outdone, our junior partner in prognostication Chris The High Schooler takes his own shot at tonight's results. Did you see that the Fug Girls were at the finale, too? Ouch. And the big news - Following PR, Episode 3 of Top Design will feature some of our favorite LA-based alumni: Sweet P, Santino Rice, Jeffrey Sebelia, Daniel Franco and our beloved little lamb Andrae Gonzalo! Watch along with us over at Blogging Top Design. With just 6 designers left and only 3 finalist spots to fill, it's time to begin finding out who the decoys are as we welcome in Episode 10 of Project Runway: "Transformation". It's back to the working world for designers and bloggers alike and BPR is all over it. Tbone will be hunkered down as usual in the live play-by-play booth bringing you all the drama starting at 9:00 p.m.
After the show, let us know what you thought of tonight's episode in our weekly reactions thread. As the designer numbers dwindle, the tension mounts. TGIW! Fashion Week Madness, Finale fun and oh yeah - my take on the Zodiac episode!! Oh my. The gossip backstage at the Project Runway 5 Finale was that Jennifer Lopez was, for sure, INDEED the guest judge. We were all excited. Then, Heidi walked out and announced what all of you already know - Miss JLo couldn't be there because of a "foot injury." Right. I bet Heidi was thinking something along the lines of, "If her foot isn't injured, I will make sure it is! Someone get Tonya Harding on the phone..."
I am kidding, of course. I adore JLo! I just am disappointed I couldn't strut my stuff for her. Is that weird? LK: After brunch I checked out of Chez Roz and into our hotel. I discovered The Scarlett and Tbone in the Business Center already busy posting the Malan reports. Scar: Actually Tbone was in the Business Center. I had decided to take a nap. I needed my beauty sleep or else I wouldn't make it to the Christian Siriano show that night. Tbone: It was more like the Business Closet. Regardless, we comandeered it for our entire stay. Bloggers never rest. LK: Later, back in the room I was getting fashion advice from The Scarlett. I tried on everything in my suitcase and decided on a black dress and zebra-striped sweater. The phone rang and the caller ID said 'Tim Gunn!' He let us know that he would see us that evening at Christian's show. Scar: We kind of all squealed a little. Tim Gunn has that effect on us. Jaded we're not. I decided I needed to use the eyelash tricks of Laura Bennett to up the fab. Tbone: I showered very early that morning. That was as 'fab' as the Tbone was going to deliver. LK: I arrived in NYC on Wednesday afternoon and checked in to Chez Roz. After a delicious meal we watched "What's Your Sign?" and headed for bed. I got up early, and headed for Bryant Park and Malan Breton's Show. I was receiving text messages and phone calls from Tbone and The Scarlett - they were on the way! Scar: I had been up until 12:30 writing BPR Love and Congrats posts and preparing the Poll for the next day. I basically got a nap before I had to hop on a train. I was definitely not fully caffeinated when I arrived in NYC. Tbone: I don't know what time I got to New York. All I know is that I look like Cousin It in that photo up there. Episode Ten is titled "Transformation." Here is the description from the Bravo website: Growing up is hard to do, but the designers get their own lesson in sophistication as they help re-invent college-aged women for entry into the working world. Guest Judge: Cynthia Rowley. LK: We were up early on Friday morning to visit the American Express Skybox at Bryant Park for breakfast. I had no idea where this was and I was dying to see it. Nancy T met us in front and we were escorted through the tent and up some stairs to a lovely room where Project Runway fans were mingling with several of the designers from previous seasons. We all enjoyed delicious food and drinks. Scar: It was fun to do something different, to arrive early before the crowd and to go into the venue before it is officially open. I was really honored to be included in this event. It looked like an intimate restaurant upstairs from the actual tent. The champagne was flowing and the chandelier was glowing. Tbone: The Skybox was designed by Frank Carfaro and it was extremely, luxuriously dark. This was good beacuse it made me look and sound a lot cooler than I really am. Plus, there was free champagne! LK: It was a thrill to visit with the American Express hosts and with the "superfans." These few had purchased tickets available only to American Express cardholders to view the show from above the tents. Tbone: There were a couple of windows that the guests could use to look down on the runways, hidden from view inside the tents. I purposely looked for them from inside but never did figure out where they were. It was like being in the security room at a casino. Scar: I was curious who these "superfans" would be. And I was equally curious about the designers invited to this event. Tbone: I was thrilled once again to spend time with one of my all-time favorite PR designers Elisa Jimenez, whose love for I have well documented. She told me about her work as a costume designer on the Disney behemoth High School Musical 3 and how she spent her summer teaching art and fashion design in New Mexico. Scar: Don't forget that Kara Janx was there along with 'Red' and her baby girl, Dylan. I noticed that a dad was in the Skybox along with his teenage daughter and her best friend. I asked the girls which of the designers they wanted to meet and they both responded enthusiastically that they wanted to meet Kit. After their photo op with Kit, I asked if they wanted to meet Jack and they nodded shyly. I later asked them who they wanted to win and they both liked Kenley Collins. Tbone: Dylan was eating free yogurt from the Skybox bar while she was doted on by her loving parents. Kara mentioned that she is working on her second collection to show . I think her first (the decoy collection at the S2 finale) would have won if it had counted. Being a new parent can chew into the design time, though. "Tbone, she has absolutely turned my world upside down", she told me in her lovely Soutyh African lilt. LK: I am certain that Tbone and The Scarlett could have stayed in the AmEx Skybox all morning but at about 8:50 I was anxious to get downstairs to my seat at the show. Nancy T watched the show from the Skybox. Tbone: I definitely preferred the Skybox to the mad crush on the floor of the tent. Plus, there was free champagne! LK ruins all the fun. Thank you American Express! We had a fabulous time. Click here to listen to Steven Rosengard and Chris March. Click here for our interview with Kara Janx. Click here to listen to Kit Pistol and Victorya Hong. Click here for our interview with Elisa Jimenez. Click here for Nancy T's interview with Jack Mackenroth. Click here for Kit Pistol. Click here for more from Steven Rosengard and Kevin Christiana. Are you interested in attending this event next season? Click here to sign up for "Entertainment Updates." Stay alert because this event sells out quickly! Update: Our friend BostonSewer blogged about another American Express-sponsored fashion week event here. A mere two days after pulling out of the rigors of judging the Project Runway finale due to a "foot injury", Jennifer Lopez today made a miraculous recovery and finished her first ever triathlon in Malibu. On Friday, Heidi Klum announced to a stunned crowd at Bryant Park that J.Lo had been scheduled to appear as the celebrity guest judge for the Season 5 Project Runway finale but had to cancel for podiatric reasons. The Nautica Malibu Triathlon consists of a half-mile ocean swim, an 18 mile bike course and a 4 mile run. The Project Runway finale judging role involves getting in and out of a director's chair, sharing honest opinions about fashion design and having food delivered to you from the craft service table. Ms. Lopez, who has been training for the event for months and had vowed to finish the event even if she had to "...crawl across that finish line" completed the race in 2 hours, 23 minutes and 38.8 seconds. There was no word after the race as to who her pick was for the Project Runway finale.